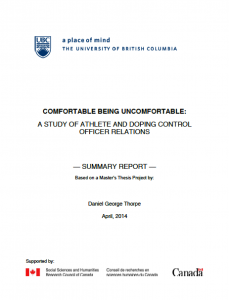 The purpose of this research was to determine how athletes and doping control officers understood their relations and which elements of those relations were the most contentious. 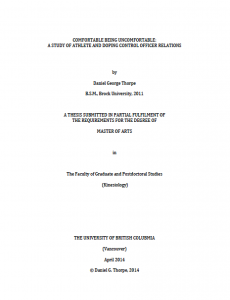 The work was conducted by CSS Coordinator Daniel Thorpe in fulfillment of his Master of Arts dissertation. Data collection consisted of 20 interviews, 10 with Canadian Olympic swimmers and 10 with Canadian doping control officers. The findings revealed that athlete and doping control officer understandings of doping control relations differed only slightly, but contention arose when there were inefficiencies in the doping control process or rule confusion.